On Australia Day the Diocese of Parramatta pilgrims made their way to the Papal Vigil and Mass. Image: Diocese of Parramatta. 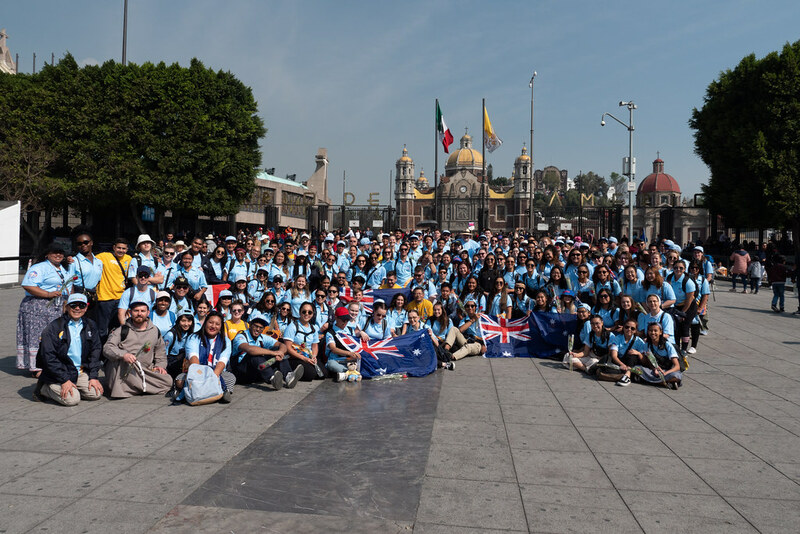 For the 171 Diocese of Parramatta pilgrims, Australia Day 2019 will be one they will never forget. The Aussie pilgrims joined thousands of others in Panama City for the final walk for the Vigil and Mass with Pope Francis. Carrying their sleeping bags, water, food and flags for the journey, pilgrims spontaneously sung Advance Australia Fair, followed by chants and prayer. Beginning the day the pilgrims gathered together for Mass celebrated by Bishop Vincent Long OFM Conv. In his homily, pilgrim chaplain Fr Benedict Mackenzie FSF, assistant priest from St Bernadette’s Parish, Dundas Valley, encouraged pilgrims to get to know their faith, because in “knowing their faith, is to love their faith”. The pilgrims then set out catching train, taxis and Ubers trying to get close to the site named the St John Paul II field. Diocese of Parramatta pilgrims walking to the Vigil and Mass. Image: Diocese of Parramatta. Roads have closed and the Panama City streets have come to a standstill for many pilgrims. Despite the delays, Panamanian locals waving to locals and shouting “Bienvenido” along the route. Handing out bottles of water and spraying garden hoses they refreshed pilgrims from the stifling equatorial heat.Tonight, Pope Francis will join the pilgrims for a night of prayer, song and Eucharistic adoration for what is considered the highlight of the World Youth Day week. The Vigil is often the most personal part of the central events with the Holy Father. It is a unique time of prayer and meeting with Christ and it has an atmosphere of total peace, but also great joy. Personally meeting and praying with Pope Francis at the Vigil will be Chris Lee. Chris Lee, a parishioner from St Patrick’ Cathedral Parish, Parramatta, and the Sydney Catholic youth leader, will personally meet the Holy Father at the Vigil and Mass. Describing the chance to meet Pope Francis as “a great personal honour” Chris will represent Oceania at the event. His mother Mili, who is also the Financial Administrator at St Patrick’s Cathedral, said this opportunity is a “blessing” for Chris and she is “grateful to God” for this moment. “I turned to my Catholic faith after my father died of cancer and I suffered a serious injury after being attacked by a stranger in a Kings Cross street over the 2012 Easter weekend”, Chris said. “I have come a long way since those dark days and I attribute that very much to my Catholic faith, which has guided me in so many ways through those tough times”. World Youth day activities will draw to a close following the Mass which concludes the World Youth Day 2019 week in Panama.